· Unique "Pressure Locking" Door Design. Provides maximum safety. · ASME Boiler & Pressure Vessel Coded. · Water Fill Safety - Fast water fill cycle switch which prevents accidental water spillage from the chamber if left unattended. · Low Water Cutoff - Will automatically turn unit off and protect sterilizer from running without water. · Drying Cycle - Automatically shuts off at end of set drying time. · Audible Tone - Signals completion of sterilization and/or drying cycles. · Pop-Open Door - The door can be set to "pop open" when pressure is vented. This eliminates any doubt as to whether all pressure has been exhausted and it is safe to open the door. · Quick Start Time - Reaches sterilizing temperature in as little as 8 minutes from cold start; less than 5 mintues on successive cycles. · Fast Venting - Less than 15 seconds. · Flexible Cycle Timer - 0-60 minutes. 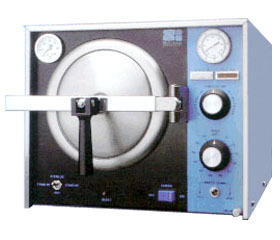 · "Power On" Light - Indicates autoclave is plugged in. · "Heat On" Light - Indicates when heat is on. 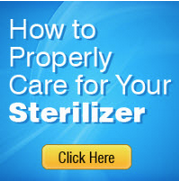 When the heat on light is off it indicaes desired sterilization temperature has been reached. The light will cycle on and off. · "Cycle On" Light - Indicates when the device is either in the heating or drying cycle. · Thermometer Gauge - Located in front panel indicates accurate temperature reading. · Pressure Gauge - Displays device internal pressure. · Reservoir Drain - Located in front of unit;allows easy draining.